Si lo que buscas son fábulas escritas en idioma ingles pues aqui encontraras 8 hermosas fabulas traducidas al español, algunas cortas otras un poco largas pero escritas en este idioma ya sea porque quieres probar tu dominio sobre el manejo del idioma ingles o simplemente para tareas escolares que te puedan pedir en el kindler y/o colegio. Espero que os guste y sea de tu agrado ;). 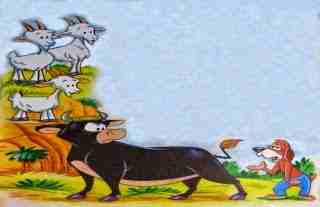 “My friend bull, what is a strong and sturdy like you doing in the company of three ugly and skinny goats? Don't you realize that those who see you will take take you for a weak animal?”. “Why did I had to listen to a flea-ridden dog I didn't even knew? I was living happily playing with the goats on the meadow, and now I’m all alone because of my own bad decisions”. So the bull went out searching for the goats to ask for their forgiveness, and when he found them, the swore them eternal friendship. Once upon a time, there was a puppy who was very curious and was always interested about the things concerning his Master. One day, the puppy heard some noises coming from the kitchen, and in order to know what was happening, he sneaked into the house. Immediately, he found a group of mice having a great feast with his Master’s food. 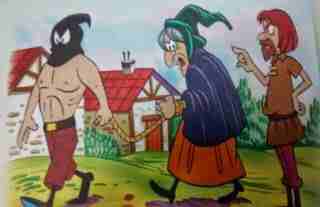 Before attacking he said to himself: “What a bunch of thieves! They’ll get what is coming for them!”. And without further ado, the puppy jumped on the group of mice, but he didn't realize that very close from there, there was a mousetrap. 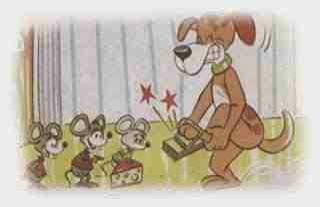 He stumbled with the mousetrap, and one of his paws was trapped, and the Puppy gave strong howls of pain. A parrot that was nearby screamed: “Well, well, see the Hunter hunted”. The Puppy, agonizing by the pain caused by the trap, begged: “Please help me! Take this thing off me, I promise I won’t bother anyone!” The good mice heard his plead, got closer to the Puppy and immediately set him free. Then, one of them told him: You see Puppy? This is what happens to you for believing you're a cat”. 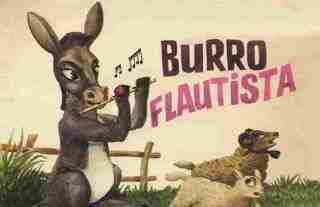 Once there was a donkey happily walking down the meadow, until suddenly, he found a little wood flute. At first, he didn't knew what it was o what it was for, but then he remembered seen it in another town. Getting close to the instrument, he took it, then he smelled it, and after given it a little puff, there was a very pleasant sound. The Donkey was amazed by his great discovery, so he decided top lay it and become a great musician. While he continued his way, the happy donkey blew the flute again and again, believing himself a fantastic musician. 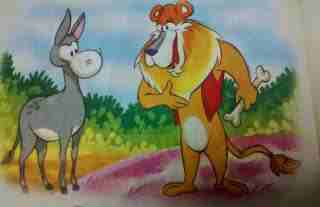 The Lion and the Donkey arrived to an agreement to go hunting together. While the lion was in charge of collecting some preys thanks to his strength and speed, the donkey will use the power of his kicks to get the others. This way, bonded by the same objective, they’ll get better results than ever. So they worked together, and the first day they shared the task with great success. At the agreed hour, the lion and the donkey met to do the recount of the pieces, and the former made three piles with all of them. “I’m taking my share”, the donkey replied. “Your share? What share? The first and the second pile are mine for the reasons I’ve given you. And the third one is also mine, because if you refuse you’ll end up becoming one of the preys in the pile”. Once, a Lion King and his page the Wolf, left the forest in search of adventure. Suddenly, the Wolf said: “Let’s stop here, my King. I hear the bleat of the sheeps. If you allow me, I’ll go for one of them so you can have an excellent meal”. The Lion accepted and thus, and the Wolf went away. Meanwhile the Lion King awaited, dreaming and savoring that great appetizer proposed by his aide. On the other hand, the Wolf got closer to the flock, and he realized that it was well protected by Dogs and armed Shepherds, ready to take down any scavenger that dared to steal their precios sheeps. 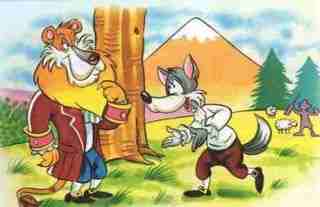 After seeing his imminent and sure defeat, the Wolf returned to his King with the tail between his legs. When the King had the Wolf in his presence, he told him: “Well, where is this exquisite sheep?”. The Wolf replied: “I don’t bring any, my Lord. They’re too skinny and… I suggest we wait for them to gain a bit of fat”. The Lion roared and said: “I’m so unfortunate! This is what I deserve for trusting in useless and false cowards”. If a person is not good to himself, how can that person be good to me? Once, in a shire, there was a very skinny sorceress that had learned the craft from her mother, who had learned it from the Grandmother. Thanks to this, she made a lot of movie tricking a lot of innocent people, saying to them: “Ladies and gentleman, I have the power to drive out the bad luck from a person and it’s home. I will save you, at a very reasonable price”. With the passage of time, she was accused of Witchcraft, and a Court sentenced her to death. The sorceress begged to the Judge to have mercy on her, but he told her: “You said you could drive out the wrath of the gods. If that’s true, then why didn't you drive out the wrath of the Judges for your sake?”. The sorceress replied: “The thing is that Judges are not fools, my Lord”. It doesn't matter how many tricks you use, you can't deceive a clever person. During an intense and hot summer day, the fields were bright yellow, the puddles were dry, and the swamps were full of dry leaves with just a bit of wáter. That day, there were two frogs walking in search of wáter, since they were really thirsty and tired. After walking for a long time, they arrived to the shore of a deep well, and sitting on the edge, they started to discuss if they should jump in it, or not. 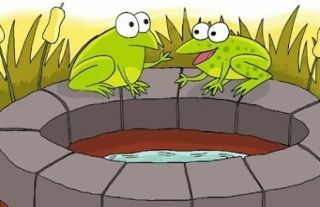 One of the frogs reasonably argued that, since the well was overflowing with water, the bottom of the well would be a nice place for them to live peacefully. However the other frog, wiser than its partner, after thinking long and hard about it, said: “That’s all very good, my friend. I have no problema about jumping in. However, if the wáter dries, how would we get out of that well?”. The sun and the wind were arguing about which one of the two was the most powerful, and their quarrel was really long, since neither one of them wanted to lose. Shortly after, they saw a man peacefully walking by, and both agreed to put their powers to test using them against that man. The wind said: “You’ll see how I remove that man’s clothes, just by throwing myself at him”. And then, he started to blow with all his might. However, as he tried harder and harder, the man clinged to his coat more and more, and continued to walk. 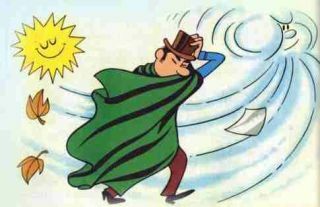 The wind got very upset, and discharged rain and snow, but the man didn’t stopped, and clinged to his coat even harder. The wind understood his defeat and finally stopped. Now it was the sun’s turn, and he smiled, overheating the ground, and the poor man, overjoyed by that sweet heat, took out his coat and put it on his shoulder. At this, the sun said to the wind: “Now you see how with kindness, you accomplish more than with violence?”.